Starmada is one of the oldest sets of sci-fi spaceship combat rules. Majestic Twelve Games released its latest version, The Admiralty Edition, in January 2008. The Starmada products are all available as full-color PDF publications. 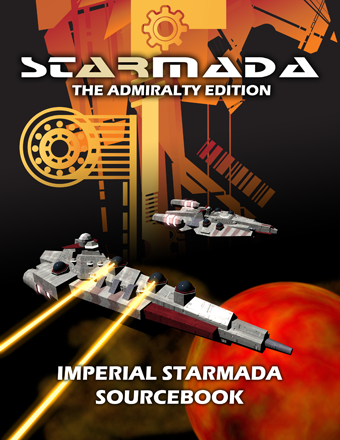 The Core Rulebook is 80 pages and contains, well, the core rules for the Starmada game system. This includes an introduction, the main rules, advanced rules, starship construction system, six scenarios, a rules index, and lastly a blank two-ship data card. The book layout is well done with plentiful illustrations and the quality of the editing and writing is high. Starmada is basically a straightforward set of starship combat rules played on a hex grid. Emphasis is on smooth play and flavor rather that gritty detail. It is designed for use with miniatures but counters could easily be used with no adjustments. The basic sequence of play is composed of four phases: Orders Phase, Movement Phase, Combat Phase, and End Phase. What makes Starmada special is that it is as much a game construction set as it is a complete game. Accordingly there are various advanced and option rules modules that players can use to create the game they want. So, for example, if you want to play in a universe with fighters there is a fighter module you can add. This extends to all sorts of things including shields, armor, cloaking devices, and more. Even the basic movement rules that use pre-plotted movement can be swapped for an alternating movement system. The rules are detailed enough where ship vs ship duels are interesting but its intent is certainly for larger battles of easily up to a dozen ships per side. What is so unique about Starmada is that all of these various options have been designed to work together. So no matter what universe you wish to represent it will play properly. This also means it is easy to represent sides with different technology levels. No matter what universe you wish to represent be it the likes of Star Trek, Star Wars, Babylon 5, Battlestar Galactica, or anything else you can successfully do it with Starmada. The Starmada ship construction rules are straightforward, clear, and flexible. They allow you to design any type of ship you would wish to have including carriers. There is no set of pre-designed ships provided so you will have to use the construction rules to begin playing. But of course Majestic Twelve has other products to help you there if you really would rather not bother with ship construction at all. 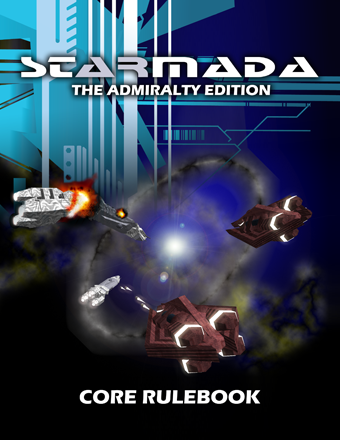 The Imperial Starmada Sourcebook is the first expansion for Starmada: The Admiralty Edition. The Sourcebook is another 80 page, full-color PDF. The Sourcebook introduces a number of new rule options including anti-fighter batteries, weapon traits, three-dimensional movement, and more. The vast majority of the Sourcebook is devoted to the races of the official Starmada universe. This includes the Terran Empire, Arcturan Federation, Negali, S’SSK Nesting, and the Kalaedinese Expanse. For each empire there is a description of the empire (ie. fluff) that describes the race within the official Starmada universe as well as a number of pre-made ships for that race along with their data cards. There are over two dozen ships provided. The fluff is reasonably interesting and gives the sense of a believable, complex universe. Lastly, the Imperial Starmada Sourcebook includes The Sovereign Stars campaign system. This is a fairly simple game that can be played as a complete game of its own or used as a battle generator for Starmada. It is based on the upcoming Sovereign Stars Third Edition campaign game. The system is very basic but does the job. The full system should be worth a look when it becomes available. 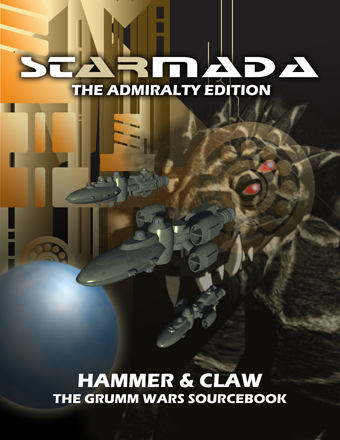 The third expansion for Starmada: The Admiralty Edition is Hammer & Claw – The Grumm Wars Sourcebook. Hammer & Claw is, again, an 80 page, full-color PDF publication. It contains a few new rules options but over 60 of its pages are devoted to the story of the Grumm Wars and its participants. The Boers, Grumm, and Nations of Earth are the races involved. As with the first Sourcebook, each race gets an introduction describing the events of the Grumm Wars and its place within it. There are also three dozen ships provided along with completed data cards and well done 3D renderings. The Grumm Wars story is quite detailed and forms a nice basis for battles. Lastly, six scenarios are provided representing the battles of the Grumm Wars. If you have any interest in sci-fi starship combat Starmada: The Admiralty Edition is almost a must get. It is an elegant, thorough, and fast playing set of rules. The construction system and rules flexibility means it can be used to represent almost any sci-fi universe you can imagine. I would recommend getting the Core Rulebook and the Sourcebook. If you do not want a pre-made universe you can easily skip the Hammer & Claw expansion without missing anything of significance. The upcoming Sovereign Stars Third Edition campaign system will only make the Starmada system more complete and an even better value. If you are looking for a solid set of rules or are tired of buying into systems that end up going out of production then give Starmada a look. It is only limited by your own imagination. Amarillo Design Bureau announced that Majestic Twelve Games is also working on a version of Starmada for ADB’s Federation Commander (Star Trek) universe (this now has the title Klingon Armada). If you already have FC or Starline 2200 miniatures this may be of interest. ADB has provided no firm dates but hopefully we will see these in 2009. This entry was posted in Board Wargames, Miniature Wargames, Reviews, Sci-Fi.